At a global level, agriculture is facing some significant challenges in the new century. If it is to keep pace with population growth and increasingly urban populations, improving yield, quality and consistency are essential; as is reducing wastage, food miles and the need for pesticides. Now, a seemingly futuristic approach – vertical farming – is an operational reality at a demonstration facility at the James Hutton Institute; and it could deliver improvements across all those desirable qualities. Developed and operated by Intelligent Growth Solutions Ltd, a Scottish-registered agritech company, the vertical farm allows complete control of the environmental factors for the chosen crop. 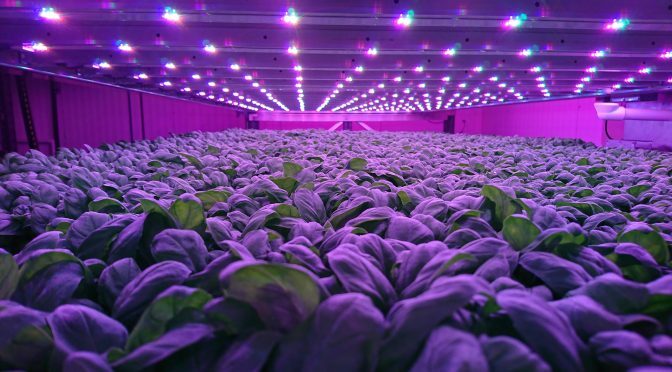 An air-locked closed system controls temperature, humidity, carbon dioxide levels and irrigation, with LED lights used to manage growth. The concept could soon be located in city centres, with the potential, according to David Farquhar, chief executive of IGS, of reducing fresh food waste by 90%. With its first crop of basil, IGS produced a yield more than double that from a traditional greenhouse – in just 20 days. To create the demonstrator facility, IGS has drawn on Scotland’s expert community in engineering, software, and horticulture, and the James Hutton Institute was deliberately chosen as the location to enhance future collaboration opportunities. Scientists and researchers are now working with IGS to assess how different crops respond to the system. Under the proposed Tay Cities Deal, an Advanced Plant Growth Centre is also planned at the Institute. “The fact that Scottish innovation and Scottish science are leading the world with something that has massive economic potential is hugely exciting,” adds Professor Colin Campbell, the chief executive of the Institute. IGS expects to create up to 150 local jobs by 2021, in areas such as software, data, engineering, robotics and automation, as it supports demand from growers, retailers and national governments who want to apply its patented technology. So, farmers with a reputation for quality produce could soon set up new city-centre production centres – taking them into new markets at a commercial scale or keeping them closer to their customers. Whilst helping to feed the world.